Waterscape construction comes in all shapes and sizes. This garden pond is a beautiful example of how the right pond and landscape plantings can enhance even the most beautiful of backyard ponds. Using the existing slope you can make this enticing waterfall that empties into this nice wondering brook. 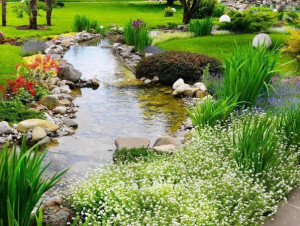 For a design of this sort you would need to have a very large yard but the good thing is that you can make a custom pond to fit your particular landscape needs. The pond design and planning of backyard ponds is not much different than commercial pond construction. You still need to plan your space and how big you would like to make your pond or water garden. Next you need to decide what kind of material you wish to use to build the pond. You can choose concrete, Epdm pond liners or in the case of large natural ponds or lakes even clay. After the decision and installation of pond liner comes what kind of media or rock to construct the waterfall and perimeter of your pond. In this case it is a combination of several different rocks to include granite, Mexican pebbles, and sandstone as well as bog plants. The upper pond is large enough of pond fish and gets shallow at the end of the creek bed. This beautiful water garden is clearly the cornerstone of this yard. 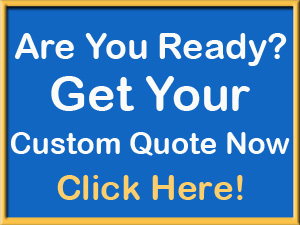 Choosing the right residential pond builders or commercial pond builders is very important. Be sure they are licensed and bonded. And have the experience and technical skills to accomplish your water garden dreams.